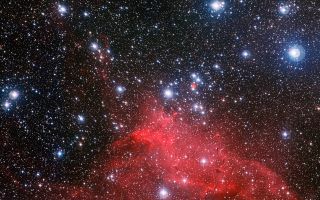 Astronomers at ESO have captured the best image so far of the curious clouds around the star cluster NGC 3572 as seen in this spectacular space wallpaper. Astronomers at ESO have captured the best image so far of the curious clouds around the star cluster NGC 3572 as seen in this spectacular space wallpaper. This new image shows how these clouds of gas and dust have been sculpted into whimsical bubbles, arcs and the odd features known as elephant trunks by the stellar winds flowing from this gathering of hot young stars. The brightest of these cluster stars are much heavier than the Sun and will end their short lives as supernova explosions.